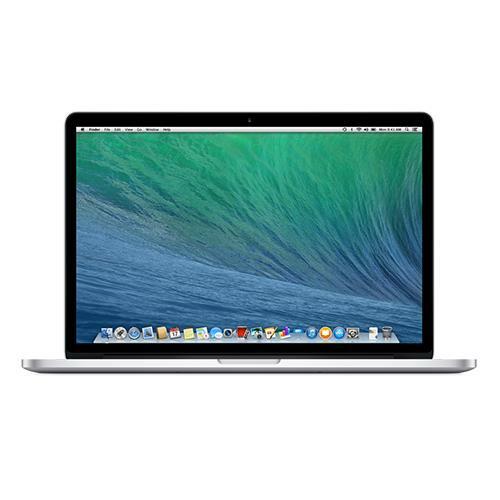 The 15.4 inch MacBook Pro with Retina display is fast and powerful, with a large, vibrant display to boot. This MacBook Pro features the latest components to deliver consistent performance. It’s also designed to be lighter and thinner than ever, improving portability and convenience. Like all the latest MacBooks, the Pro with Retina display is powered by the latest Intel Core i7 processor. This makes the MacBook Pro more than capable at handling even the most demanding tasks. The MacBook Pro Core i7 also features a dual GPU configuration comprising an integrated Intel Iris Pro Graphics GPU and an NVIDIA GeForce GT 750M discrete GPU. This dual GPU setup enables the MacBook Pro in enabling an extremely powerful graphics performance, so you can use the notebook for editing and viewing high-resolution photos, visualizing data in 3D, and playing the latest games. The MacBook Pro’s Retina display makes these tasks even more visually pleasing, thanks to a 2880-by-1800 resolution, reduced glare, and higher contrast. For added speed, the MacBook Pro 512GB uses all-flash internal storage. This all-flash architecture makes the MacBook Pro significantly more responsive, whether you’re browsing expansive photo library or simultaneously running resource-intensive software. You’ll even be able to edit multiple streams of 1080p content on Final Cut Pro X. The 15-inch MacBook Pro with Retina display may be thin and handy, but that doesn’t mean it lacks for any I/O port. Like the newest Mac Pro, this MacBook sports multiple ports for Thunderbolt 2, USB 3.0, and HDMI, so you can connect the notebook to external displays and HDTVs.